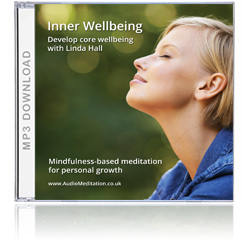 Gentle, yet powerful guided meditations for inner wellbeing and relaxation. These three meditations help you to manage anxiety and negative thinking, release stress and develop a kinder relationship with yourself. They teach you how to build and maintain a healthy base-line for wellbeing through practicing mindfulness and self-compassion. 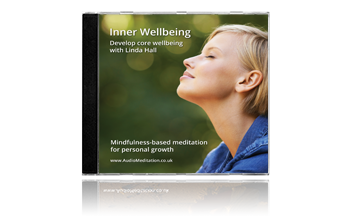 These guided meditations teach you how to stop ‘anxiety thinking’ patterns; show you how to manage discomfort and emotions; and help you to be less self-critical. The increased demands and challenges of 21 Century life make it all the more important that we maintain a core sense of inner wellbeing. Awareness and self-compassion are the building blocks for us to be able to do this. Learning to practice mindfulness, and being kinder to ourselves on a day-to-day basis, decreases our stress load, opens up opportunities and allows us to lead more satisfying and fulfilling lives. Awareness gives us choices. Becoming aware of what’s blocking our ability to feel good in ourselves and about our life enables us to make conscious, positive choices that empower us rather than detract from the quality of our lives.